While we feature good tweaks for making Chrome the default browser, there are a whole host of browser tweaks which only support iOS’ default Mobile Safari (such as Safari Download Enabler or OneByOne Safari). If you can’t get the most useful tweaks to come to your favorite browser, there’s always a second option of using more tweaks to make the standard browser more like Chrome. Safari Omnibar adds the unified Chrome address and search bar to Safari. The Omnibar one of the most striking advantages that the iOS version of Chrome has over Safari. Type in anything, and the search bar will take you there. Just like the Chrome’s input bar, the Safari Omnibar support’s URL addresses and search terms. The one big difference between the Safari Omnibar and the version found in Chrome is that the Safari Omnibar does not include keyboard shortcuts for punctuation or ‘.com’, but when was the last time you used that anyway? There are a few other necessary interface changes included in the tweak. One that you’ll notice right off the bat is the dedicated button for Safari’s Find on Page feature. Unexpectedly, Safari Omnibar loads a new search script over the default one used by the iPad’s standard Mobile Safari browser. This could be a problem for some modders. Before I installed this tweak, I manually switched the default search engine from Google to DuckDuckGo, and with Safari Omnibar enabled, the search engine is back to Google. 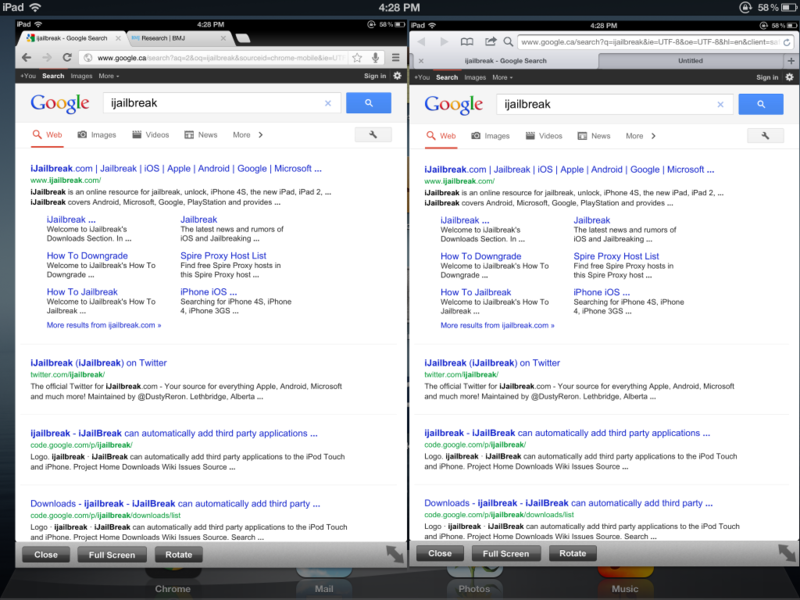 After I uninstalled Safari Omnibar, the default search bar also reverted to Google. Safari Omnibar supports the iPhone, iPad, and iPod Touch running iOS 5 and up. You can download the Safari Omnibar tweak for free from the BigBoss repository. What’s your favorite Safari Tweak? Share your thoughts in the comments section below. This would’ve been an awesome tweak, but if you go to a site that allows you to use Safari reader, the right edge of the bar gets pushed off the screen so you can’t refresh or stop a page from loading.